Where space is limited and appearance is essential, sliding door wardrobe is perfect solution for any room. Dimensions: W250cm x H215cm x D60cm. White wardrobe with three sliding doors. 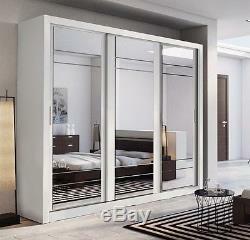 Full mirrored doors to visually enlarge your bedroom. Hanging space on both sides and removable shelf space in the middle. Made from 16mm high quality laminated board. Our Arti wardrobe is easy to assemble and comes in Grey Matt to match any bedroom decor. Provides good space for smaller rooms. Made from 16mm high quality laminated board to make it sturdy and to last you a long time. The wardrobe is in three sections with two hanging areas and shelves down the middle for folded clothes. The furniture is brand new and packed in its original packaging. It is delivered flat packed for self-assembly. ONLY PICTURE ASSEMBLY MANUAL INCLUDED. There are no written instructions. Due to the technology limitations colours on the screen may vary from real colours of furniture. We reserve the right to cancel your order if no valid telephone number will be provided within 48 hours from purchasing the product. Thank you for purchasing from us. Please read the following information carefully. Delivering our products is just as important to us, if not more important, than sourcing the products themselves. Delivering a damaged item doesn't make us look good! This is the reason why we deliver goods by our own vans and employ own drivers who are very friendly and helpful. We start very early in the morning. Goods are delivered 7 days per week between 6.00am and 8.00pm. We are unable to give a specific time slot during the day but we will notify you if you are one of the first points of drop. Leave appropriate instructions if the property is gated and has concierge. You can book additional service if you wish to have it delivered to your property in case you live on 1. Floor and above (multi-storey building). This is a subject of. We are unable to deliver to a specific room within a house. The driver will also call on the number you provided minimum half an hour prior to arrival as a reminder to ensure that somebody is available in the property. This right is not extinguished, if you have erected the furniture. Furniture is the vital ingredient that will make your house a home. This is why, at Arthauss , we strive to provide a truly excellent choice of furniture for every budget and every taste. We're here to offer you an inspiring and imaginative range of high quality furniture. We want you to show a real expression of your style and individuality throughout the way you decorate your home. Should you wish to return the goods it is your responsibility to take good care of the furniture. You are the owner of the furniture once it has been delivered to you and you are liable for any loss or damage. We are unable to offer collection service. Failure to take reasonable care may result in a claim against you. To minimise the risk of any such claim we ask that you return the goods in appropriate packaging such as to prevent damage in transit. In the unlikely event of damaged, faulty or incorrect goods we will rectify the error by sending replacement goods or parts. We do not take responsibility for incorrectly assembled items or any damages occurred during the assembly process. The item "Brand New Modern Bedroom 3 Sliding Door Mirror Wardrobe ARTI 2 250cm White Matt" is in sale since Wednesday, August 9, 2017. This item is in the category "Home, Furniture & DIY\Furniture\Wardrobes". The seller is "arthauss" and is located in LINCOLN. This item can be shipped to United Kingdom.